- Coconut Lime - New! - Bay Rum - New! - Spiced Pear - New! - Sandalwood Amber - New! - Summer Rain - New! 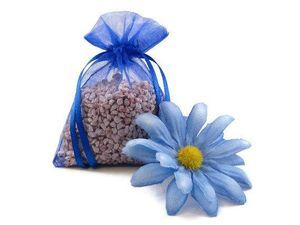 Our Aroma Corn Sachets are made of crushed corn cob fibers. Some sachets may contain dried flower buds or parts - where applicable, e.g. Lavender Buds, Rose Buds, etc. These can be used anywhere! Freshen the air in your car, closet, drawers, luggage, office, gym bags or shoes... it's an ever growing list. For an even stronger fragrance release, place them near a sunny window. Sachets come in a variety of colours and are filled in a 3x4" organza bag filled to the brim with crushed corn cob fibers. CAUTION: Keep out of reach of children and pets. Do not place sachets directly on wood, plastic, or any painted surface, as damage may occur. Custom fragrance requests are accepted. If you prefer another scent that is not listed, please contact us and we'll do our best to provide it for you!